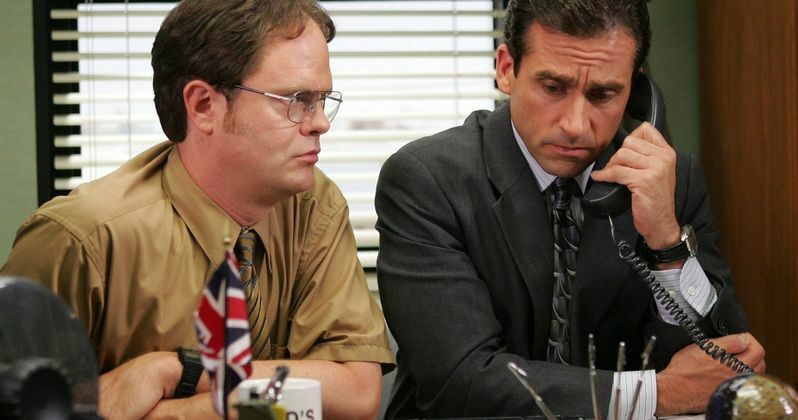 NBC may be looking at a revival of The Office, but Steve Carell doesn't think that would be the best idea. Even though the sitcom has been off the air for more than five years, the show maintains an absolutely massive following, partially thanks to it being on Netflix, allowing for new fans to discover it all the time. It's a popular series and revivals are all the rage right now. So why not bring it back? Steve Carell moved on from the role of Michael Scott during the events of season 7 and it's hard to think of an actor who has ever been so willing to commit to a role at times. Michael Scott was unlikable, a buffoon and politically incorrect. And that's where Carell thinks The Office may not fare so well in the modern climate. Here's what he had to say about it in a recent interview. "Because The Office is on Netflix and replaying, a lot more people have seen it recently. And I think because of that there's been a resurgence in interest in the show, and talk about bringing it back. But apart from the fact that I just don't think that's a good idea, it might be impossible to do that show today and have people accept it the way it was accepted ten years ago. The climate's different. I mean, the whole idea of that character, Michael Scott, so much of it was predicated on inappropriate behavior. I mean, he's certainly not a model boss. A lot of what is depicted on that show is completely wrong-minded. That's the point, you know? But I just don't know how that would fly now. There's a very high awareness of offensive things today-which is good, for sure. But at the same time, when you take a character like that too literally, it doesn't really work." Indeed, a lot has changed in the last five years and a character like Michael Scott may not resonate with new viewers. At least not in a positive way. But then again, who says Michael even has to be part of it? The final two seasons of The Office didn't include him and when news first broke that the network may be looking at a revival last December, it was reported that only some of the original characters would return. It's quite likely that Steve Carell, even putting his concerns aside, would want to sign back up for anything more than a glorified cameo if the show does return. John Krasinski has repeatedly said that he would return, but has suggested that doing an annual Christmas special, or something along those lines, might work better than a full-on revival. Meanwhile, we haven't heard much from NBC on their possible plans for more episodes of The Office recently, so it's tough to say where that actually stands. This news originated with Esquire.